Do you know why Japan is called ‘Japan’ in English and not ‘Nihon’ or ‘Nippon’ as it is pronounced in Japanese? It is said that the first Europeans to come to Japan were three Portuguese traders who drifted onto the shores of Tanegashima, an island south of Kyushu, in 1543. However, the map you see here was produced in Venice fifteen years earlier, in 1528. It is the first map produced in Europe that represents Japan as a country in its own right. 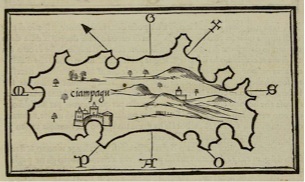 This woodblock-printed map appears in a volume entitledLibro di Benedetto Bordone, published by Nicolò Zoppino and its dimensions are 5.5 x 14.5 cm. The illustration, which resembles a treasure island map, bears the inscription ‘Ciampagu’. It depicted a land that no European had visited yet but that spoke to the imagination due to the description in The Travels of Marco Polo that it was ‘a wealthy island producing gold in abundance’. The map is part of a collection of as many as sixty old maps held by the Lisa Sainsbury Library, a collection entrusted to the library by the former British Ambassador to Japan, Sir Hugh Cortazzi, and his wife Lady Cortazzi. Thanks to a collaboration with the Art Research Center of Ritsumeikan University, all the maps can now be viewed on the Sainsbury Institute’s website. On 12 May 2013, the Lisa Sainsbury Library celebrates the tenth anniversary of its opening. To commemorate this event, an exhibition of old maps entrusted to the Library will take place at the Japanese Embassy in London from late June. All those interested in visiting the exhibition are welcome to come and look round. 1. There is also a theory that the English word ‘Japan’ has its origin in Malaysian. However, there is no doubt that the Malaysian word for Japan was influenced by its Chinese equivalent ‘Zipangu’. Therefore it can be said with near-certainty that the etymology of the word ‘Japan’ is traceable to the Chinese reading of the characters that mean ‘Land of the Rising Sun’. Akioka, Takejirō. Nihon chizushi. Myūjiamu Tōkyō: Tosho, 1997. Cortazzi, Hugh. Isles of gold : antique maps of Japan. New York: Weatherhill, 1983. Hubbard, Jason C. Japoniӕ insvle : the mapping of Japan. Houten: Hes & De Graaf, 2012.